Set between gingerbread-trimmed buildings and translucent aquamarine sea, on an island too sparsely populated to merit even one traffic light, Hope Town Harbour Lodge is a delightful collection of historic buildings and charming cottages. The resort sits perched on a tiny hill in the village of Hope Town, on the northern tip of Elbow Cay, a narrow 8-mile-long island in the Bahamas’ Abaco Islands. Settled by British loyalists fleeing the newly independent United States of America in 1785, fishing and wrecking were the main sources of income for decades. Then the British built a candy-striped lighthouse that put an end to the shipwrecks. That iconic landmark is now one of the last operational kerosene-fueled lighthouses in the world. By the 1960s, tourism began to flourish. 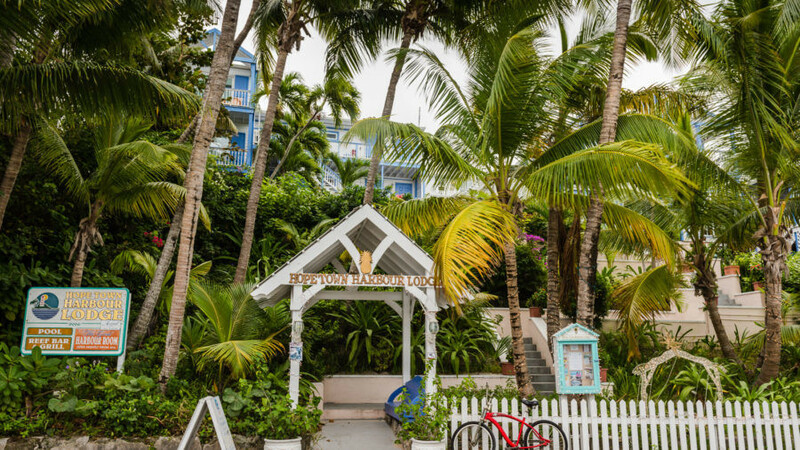 Visitors started purchasing second homes on Elbow Cay–including well-known figures such as George Gallup (of Gallup Poll fame)–with an estimated 300 second homes there now. That’s when the former home of Brigadier General Thomas Robbins was purchased by Bahamians and converted into what became Hope Town Harbour Lodge. One of the quirkiest traditions on Hope Town is that when folks move in they put up a sign pointing to their origin. Look closely and you’ll find several second home owners who come from Northeast USA. More recently, the island provides the setting for many real and at least one fictional wedding. Among the many beautiful destination weddings, which can include a procession from the historic Methodist church along narrow roads to the beach, was the 2004 wedding of Red Hot Chili Peppers drummer Chad Smith. Then, in 2009, Hope Town saw an influx of 84 cast and crew members for a fictional wedding on TV sitcom Scrubs. Queen’s Highway, one of the main thoroughfares in Hope Town. To put that in context, you have to realize that the island population hovered at 458 in 2010 (including all those second home residents.) Hence, no traffic light. Only a handful of cars are allowed; one gas pump serves the whole island. There are only a few ways to get around–by boat, bike, foot, or electric-powered golf cart. Hope Town Harbour Lodge is at the heart of as pristine an island setting as you’re likely to find today. Most guest fly in to Marsh Harbour Airport (on short direct flights from Nassau, Atlanta, and multiple Florida cities) and then take a short taxi ride to Albury’s Ferry. A 20-minute boat ride takes them directly to the hotel dock (which also serves the village) where they are met with a golf cart that carries them to reception, and bypasses the steep steps up to the lodge. A smiling receptionist greets guests in the lobby, offering trip planning assistance, and escorting them to their rooms upon arrival. The lobby is an intimate space recently renovated in beach-inspired tones with white-washed furniture, taupe tiles and wallpaper, and seashell-framed mirror. The lobby renovation is part of several recent refreshments at the resort, extending to the pool, bar & grill, and to the cabanas. The most notable change, however, is that the resort has just joined Choice Hotels’ Ascend Hotel Collection brand which allows it to retain its unique character while being part of a group of properties known for being upscale and one-of-a-kind. The resort holds a little over twenty rooms spread between the main lodge, poolside cabanas, and oceanfront cottages. Configurations range from rooms for two, up to six persons in historic Butterfly House. Built in 1889, the little house retains its original character although it has been completely modernized. Crisp rooms–new beds and bedding throughout–feature lively colors and tropical accents. Our room, an oceanfront cottage labelled “Passion Fruit,” was exceptionally comfy. Breezy bleached wood-panel walls, high ceilings, and rattan furniture fit the surroundings perfectly. Its well-stocked kitchenette goes beyond essentials to also provide a microwave and tea kettle. The bathroom, with double Italian ceramic sinks and walk-in shower, is spacious and stocked with high end L’Occitane toiletries. But the best feature of the cottage is its ocean-facing balcony, replete with Adirondack chairs and chaise lounge, with added perk, a hammock beckoning between adjacent palm trees. Rooms, like the rest of the property, have fast WiFi. No televisions, but plans are in the works to install them in all rooms shortly. Breakfast and lunch at the poolside Reef Bar & Grill are popular with both guests and locals. Guests rave about the pancakes and we love the local breakfast, the Fire Engine special of corned beef hash and grits. At lunch, we recommend the conch burger, breaded and fried, this is a particularly tasty way to sample a local delicacy. Romantic dinners–wine, lobster, and candlelight–are the specialty in the Great Harbour Room, at the main lodge. Start off with a cocktail in the cozy bar next door, and do stick around for dessert; you don’t want to miss warm Rum Cake with Rum Raisin Ice Cream. A newly finished pool surrounded by fresh landscaping and the bar restaurant provides the social heart of the resort, but the main attraction is undoubtably the beach. Crystal-clear ocean and a long stretches of sugar-fine white sand invite Instagram-worthy pics. A healthy reef close to shore offers excellent snorkeling, and mostly calm waters are great for a variety of watersports. Beach conveniences are limited to chaise loungers, and snorkel gear rentals. However, there’s a plan in the works to provide non-motorized watercraft. Daily rates for rooms and suites range from $150-$675, and includes complimentary WiFi. Bottled water provided, although tap water–reverse osmosis filtered sea water–is surprisingly drinkable. Leashed pets allowed on premises, but not in rooms. Smoking forbidden.